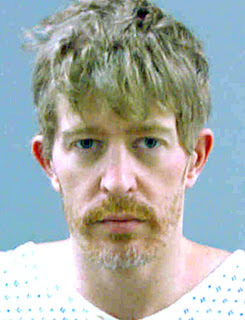 In the latest twist to a deadly shootout that stunned the residents of Ogden, Utah, a recently revealed search warrant affidavit provides evidence that suggests the defendant, Matthew David Stewart, 37, may have been an anti-government extremist. The shootout began on January 4, 2012, after police launched a raid on Stewart’s residence to execute a search warrant—an informant had alleged he was growing marijuana (16 plants were reportedly later found). According to police, Stewart hid, opening fire on officers as they searched his residence. Six officers were hit, some more than once, and Ogden police officer Jared Francom was wounded fatally. Stewart allegedly continued firing as the officers fled the residence. Police eventually wounded and subdued him in a backyard shed. Stewart was charged with aggravated murder, seven counts of attempted aggravated murder, and production of a controlled substance in a “drug free zone,” along with a dangerous weapons enhancement. The affidavit further claimed that police recovered “computer-generated documents” related to anti-government extremism, anti-police Web sites, Oklahoma City bombing Web sites, instructions for making potassium chloride (used in explosives), and a map to the closest IRS building (where Stewart once worked as a security guard), among other items. According to the affidavit, police also discovered “what appeared to be the makings of a bomb,” which were later removed and detonated by the bomb squad. Officer Francom was the first police officer to have been killed by a suspected domestic extremist since May 2010, when two West Memphis, Arkansas, officers were killed by anti-government “sovereign citizens.” Since 2000, 27 police officers have been killed in the United States by domestic extremists.